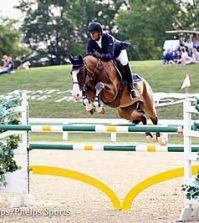 Lexington KY – July 27, 2012 – Today marked the third day of the Kentucky Summer Horse Show, and it seemed as though the competition was only beginning to escalate as the amateur and junior jumper riders showcased their skills in the Rolex Stadium. Topping the High Amateur-Owner Jumpers, Paige Johnson piloted La Martinee to a double-clear victory, and also claimed third with her second mount Monopoly. Chelsea Moss slid into second aboard Dolce D’Ive Z, also completing a fault-free short course. In the High Junior Jumpers, Chloe Reid claimed the blue ribbon with her quick and clear round aboard Damascus, while Emanuel Andrade placed second with Costa, and Kelsey Van Ackeren rode to the third place ribbon with Vernon G.
Although clouds hung petulantly over the Kentucky Horse Park with threats of rain, the sun moved into place as riders prepared for the High Jumper events. Today, Marina Azevedo’s first round track included a vertical-oxer double combination, an oxer-vertical double combination, a large oxer-vertical-oxer combination, bending lines and rollbacks. Each caused errors for some of the entries, as well as seeing an immense number of rails over the SSG vertical. For the jump-off riders had to use an open gallop across large parts of the ring and take tight turns to shave seconds off their time, while also leaving the fences in place. Eventual winner, Chloe Reid of Washington, D.C., was the pathfinder during the High Junior Jumpers aboard Damascus. They were able to produce the first fault-free short course, and post a second clear effort in the jump-off in 37.445 seconds. “I like going in first because I have it set in my mind how I want to do it. If I watch other people, it could sway my decisions. I knew from the other classes this week that the time allowed has been hard. I planned on keeping it quick around the corners, and she did it really well,” Reid remarked. Each consecutive rider attempted to move into the jump-off; however, only Emanuel Andrade and Costa were able to clear the first-round course without incurring time faults. During the short track, Andrade navigated Costa with ease, but the pair proved that the track was definitely easier said than done. They took the second place behind Reid, stopping the clock in 38.677 seconds, but collecting 12 faults. Kelsey Van Ackeren of Austin, TX, aboard Vernon G posted the third clear round of the afternoon, but a time fault kept the pair out of the jump-off. Their time of 80.124 earned them the third place finish. “Damascus is a new horse for me, this is only our second show in America, and we are still trying to get to know one another. My trainer told me to go in and just be smooth as possible, but go out, have fun and see how fast you can go,” Reid described. “In the deeper distances and long distances she needs a leg-to-hand feeling. We are a great match, she needs the kind of ride that I love,” Reid smiled. Earlier in the day, the High Amateur-Owner Jumpers took their turn over Azevedo’s course. Paige Johnson was the first to enter the ring and take her try at the course. 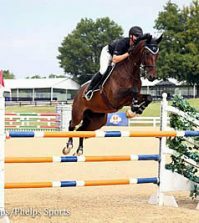 She rode the nine-year-old Monopoly, owned by Salamander Farm of The Plains, VA, to a clear first round just under the time allowed, and took an immediate lead as she tripped the timers in 37.467 seconds during the jump-off. An unlucky rail earned the duo a four-fault total. It seemed as though their score would go untouched as rider after rider attempted the track without progressing into the second round. Seven rounds later, Johnson entered the ring aboard a different mount, La Martinee, also owned by Salamander Farm. Focusing on the path she laid down with Monopoly, Johnson put forth a double-clear effort in 38.322 seconds, rising in the ranks to the top of the leader board. 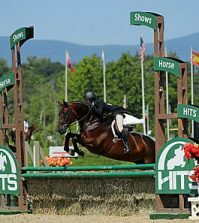 Chelsea Moss and Dolce D’Ive Z, owned by Stormfront Stables LLC of Medford, NJ, were the only other pair to go double-clear on today’s track in the High Amateur-Owner Jumpers. Over the short track they clocked in at 40.713 seconds, good enough for the second place prize, edging Johnson and Monopoly into the third place position. A Show Jumping Hall of Fame Classic will be held for both the High Amateur-Owner and High Junior Jumpers on Sunday. 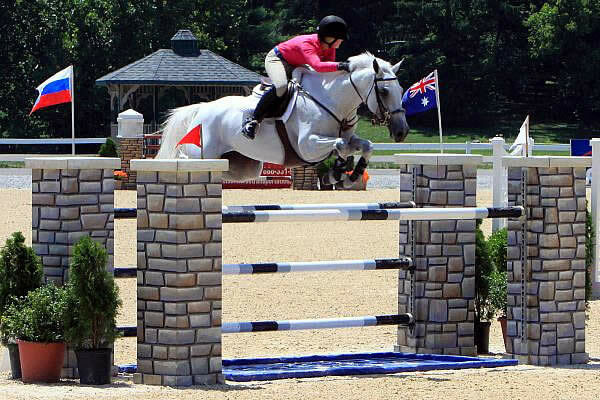 The Junior Jumper Classic will feature $1,000 in bonus money for the SSG Riding Gloves ‘Go Clean for the Green’ Promotion, which went to Junior Rider Abigail McArdle during the Kentucky Spring Horse Show. Tomorrow, the highlight event in the Rolex Stadium will be the $40,000 Kentucky Summer Grand Prix sponsored by Audi of Lexington. The event is set to begin at 7 p.m., and will feature the nation’s top horse and riders competing for the winning prize, as well as bonus money through SSG Riding Gloves. 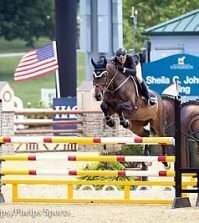 The Kentucky Summer Horse Show will conclude on Sunday with the Junior and Amateur-Owner Jumper Classics. 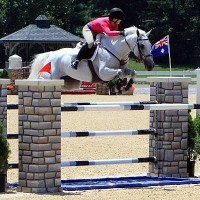 For more information about Kentucky Horse Shows, please go to www.kentuckyhorseshows.com.